Tuna, bonito, escolar, skipjack, mackerel, needlefish, saurie, kingfish, wahoo, albacore, amberjack, blue fish, dolphin, mahi mahi, marlin, anchovy, herring, swordfish, Australian ocean salmon, Bombay duck (a kind of dried fish) (Fig 33.12). Scombroid poisoning is a form of ichthyosarcotoxicosis (the toxin is contained within the flesh of the fish). 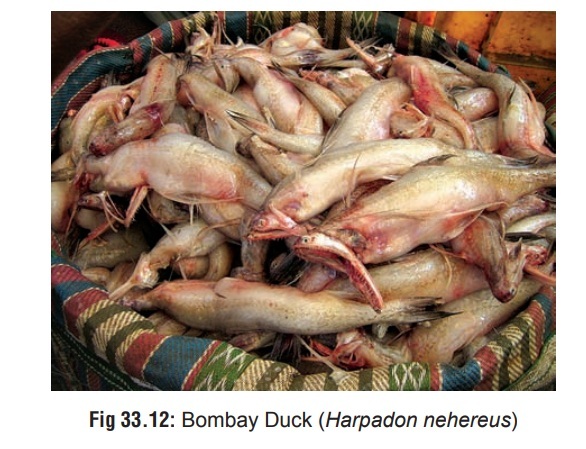 Poisoning occurs from consumption of improperly preserved fish in which the endogenous histidine has been broken down by bacteria into high levels of histamine and saurine. Unfortunately, tainted fish may look and smell normal. Rarely, there is a “sharp” or “peppery” taste. To add insult to injury, even if such contami-nated fish is subsequently cooked well or smoked, the toxins are not destroyed. The CDC (USA) has reported that scombroid fish poisoning has been most often associated with the consumption of tuna, mahi-mahi, and bluefish. Immediately after being caught the fish is generally non-toxic, but toxicity increases as the bacterial count rises. Scombrotoxin formation can also occur if the fish is improperly refrigerated. Few minutes to few hours: Symptoms may develop as early as 5 to 10 minutes after eating the fish, or be delayed up to 1 to 2 hours. Although most cases are mild and self-limiting, resolving in 3 to 36 hours, potentially life-threatening effects have occurred. · Manifestations are mostly histamine-mediated, and comprise erythema of face, urticaria, pruritis, dermal flushing, diaphoresis, burning sensation of the mouth, dizziness, throbbing headache, vomiting, diarrhoea, and abdominal cramps. · Palpitations are frequently described. · Diarrhoea and vomiting are also common findings after scombroid poisoning. · Tachycardia/bradycardia and hypotension have been described. · Conjunctival irritation, and angioneurotic facial oedema may develop. · In severe cases there may be bronchospasm and respiratory distress. Symptoms usually subside on their own in 6 to 12 hours. · Histamine levels of serum and urine will be greatly elevated. · Detection and quantitation of histamine in implicated fish flesh is more important. Normal fish has less than 1 mg of histamine per 100 gm of flesh. Illness is usually associated with more than 100 mg of histamine per 100 gm of flesh (though illness can result from much less concentrations). · Usually such fish appear normal and may not either smell or taste bad. · Occasionally, the skin may have a “honeycombed” appearance, or the taste may turn pungent or peppery. Diagnosis can be confirmed by measuring the histamine level in the fish which may exceed 100 mg%. The maximum acceptable level has been fixed at 50%. The recommended method of estimating histamine level in fish is capillary electrophoretic assay. · Outlined in Table 33.9. · Activated charcoal may be useful in the early stages. · The role of steroids in management of scombroid poisoning is controversial. · Cimetidine has been successful in patients refractory to conventional antihistamines. It has also been used success-fully as first-line treatment. · To prevent scombroid poisoning, the fish needs to be continuously frozen, or refrigerated at less than 32°F from the time the fish is caught until it is prepared for consumption.